So, I made one that I could enjoy that is sweetened with honey, thickened with arrowroot powder, and uses lime juice for a little acidity. It came out to be the best jam to date and is currently sitting proud on the top shelf of my refrigerator because I'm so excited and because the strawberry jar is my new favorite kitchen item. 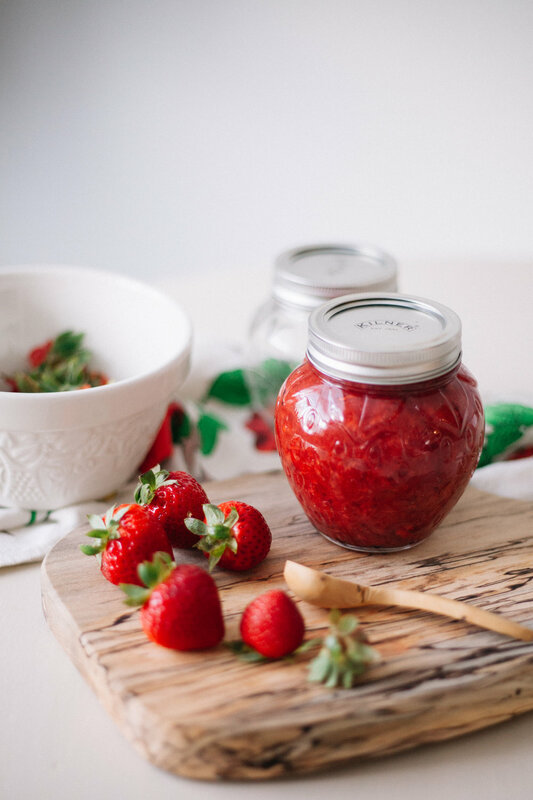 ** I used this Kilner Strawberry Jar and these cute forest mixing bowls from Mason Cash (here). Since Georgia is so abundant with fresh fruit this time of year, I'll use this same base recipe for peaches, figs, apples, etc and make tons of fruit jams to last me through the winter-time. This recipe is flexible to use with other berries, fruits, etc as long as the fruit is easily mashed by hand or you can use a potato masher once it's cooked down and softened a bit. wash and slice up strawberries, place in large pot. 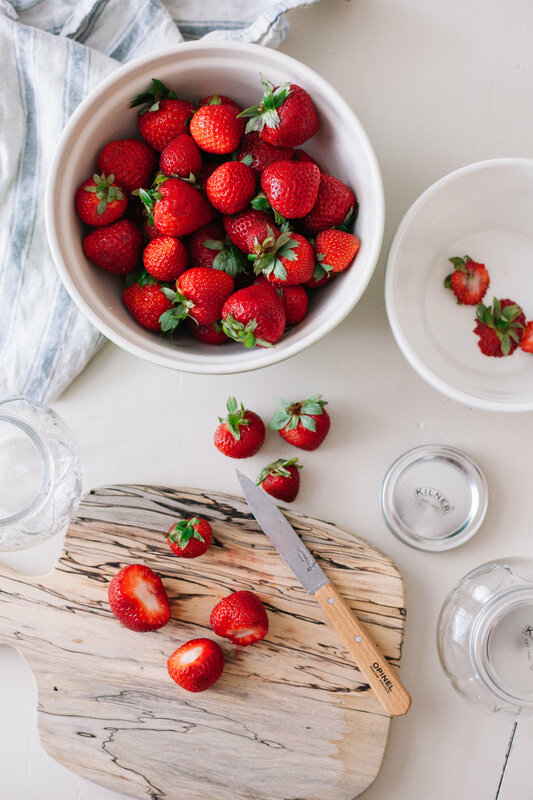 with heat on medium high, use the back of a wooden spoon or a potato masher to mash the strawberries. add lime juice and 1/2 c honey, stirring and mashing larger strawberry pieces. once the jam begins to bubble, bring down to medium-low and using your wooden spoon, mix in 2 Tbsp of arrowroot powder to thicken. add the powder a little at a time to avoid clumping. simmer until jam has thickened, 15-20 minutes. spoon into a clean jar and refrigerate. keeps in the fridge for 1-2 months.